My brother, a rebbe in Yeshivas Ner Yisroel’s Mechina high school, and his wife, the daughter of the legendary Menahel Rav Yosef Tendler, z”l,were recently blessed with two new grandsons. Both were named Simcha Bunim, after my father, hk”m, whose first yahrtzeit will be observed on 20 Kislev. When I wished my brother and his wife “veiter simchos!” – “further happy occasions! – I wondered if I had inadvertently uttered a double entendre. It turns out I did. My wife and I just returned from Milwaukee, where another bris took place, as our daughter and son-in-law welcomed their new little boy to their family; he, too, is a Simcha Bunim. I’ve been thinking, as you might imagine, about the name. If that theory is right, though, both names are uncannily descriptive of my father. 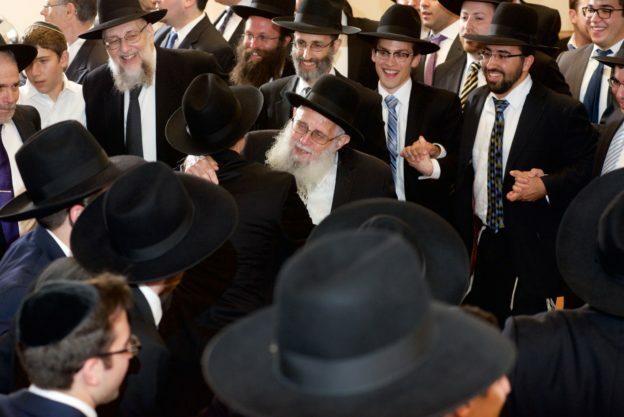 He was renowned for his ready, radiant smile, and over the more than sixty years he served as a shul Rav, countless congregants and strangers alike were greeted with his sever panim yafos. He was a reservoir of friendly, encouraging words for all who sought his counsel. But simchah isn’t only an interpersonal ideal. We exist for avodas Hashem. And Dovid Hamelech reveals that our lifelong service be done with simchah – ivdu es Hashem bisimchah. Jewish joy occupies a very high plane indeed. I don’t know if my father was able to embrace simchah as he fled as a young teen with his family from their Polish town before the invading Nazis in 1939, or when he saw his uncle shot dead before him, or when he and other Jews were locked in a shul that was set aflame (though I imagine he must have smiled when a German army officer – Eliyahu Hanavi, the Jews suspected – passed by and ordered the Jews released). Or if he attained moments of joy during the years he and his Novardok chaverim spent as the guests of the Soviets in a Siberian work camp. But knowing Norvardok’s stress on making the most of every moment of life, it’s entirely plausible. What I know for fact, though, is how Simchas Torah was his Yom Tov. He rejoiced then with vigor that left anyone who witnessed it astonished. And how delighted he was during his long career to be able to provide a spiritual home for a congregation of Yidden of widely diverse backgrounds and levels of observance. When my siblings and I were young, it didn’t occur to us that a Rav davening all the Yamim Noraim tefillos (and blowing the shofar) himself was unusual. When, eventually, he trained others to daven for the amud, he took great joy in that, too, and always happily encouraged the new baalei tefillah. He also undertook the most menial tasks of maintaining a shul with joy. The shul had no shamash, only a rabbi who saw honor in every shul chore. A congregant recounted seeing him in the shul perched on a 20-foot ladder, changing a light bulb. “Because the old one burned out,” he explained patiently, with his characteristic smile. My suspicion of what might be coming was borne out. The video was of my father, well into his 80s at the time, being mesame’ach the chassan and kallah with vigor and joy. At present, he has five little boy descendants who carry his name (and one little girl who was named Simcha). May they, and, be”H, veiter simchos, herald a new infusion of joy into our world. This entry was posted in Jewish Thought, Personal Reflections, Personalities on November 22, 2017 by Rabbi Avi Shafran.